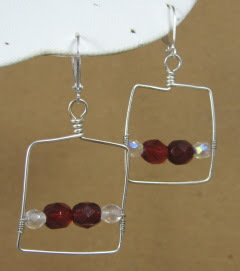 I love to sit down and play with my beads and wire every once in a while for the heck of it. I not only learn somthing new almost every time, but occasionally I stumble across something that I wouldn't mind making more of. I love hoop earrings, and I love that hoop earrings have made a comeback from the good ol' 80's. However, I got to thinking that I grow tired of the same old circles, so I thought about squares. Then, of course, I have to add something "sparkly", or it wouldn't be worthy of being a Sparkly Strandz creation, so this is what came about. I took this picture just to have it, so it doesn't do the earring justice. They are way cute on.